A WOUND IN TIME: GETTING READY FOR MY NEW PRODUCTION BUT THE RE-MOUNT OF AWIT IS NOT FAR BEHIND! GETTING READY FOR MY NEW PRODUCTION BUT THE RE-MOUNT OF AWIT IS NOT FAR BEHIND! Yes! 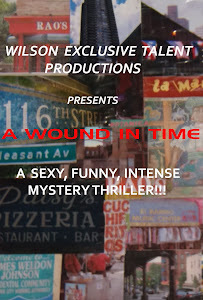 Very excited about my new production "Blood Makes The Red River Flow" (in which I am starring) but the re-mount of "A Wound In Time" is not far behind. It will return with a limited run and filmed for international DVD distribution. I am putting those wheels in motion and looking forward to a Spring opening! You will see some familiar faces from the old production as well as some new faces. Stay tuned and don't forget your tickets for my historical Creole drama opening February 21st!